While every parent knows the lack of appreciation that a toddler has for their precious possessions, the King’s Speech co-producer Simon Egan learned the hard way last week that this also applies to special awards. 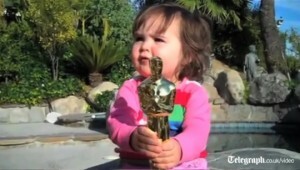 Just hours after receiving the Oscar for Best Picture, Simon Egan gave the gold statue to his 15-month-old daughter Lara to pose with for a picture when she suddenly she dropped it. The music at the party couldn’t cover up the distinct sound the award made when it tumbled onto the concrete patio, causing party goers to stop dead in their tracks. “And then I saw that horrific moment where the statue just fell and it didn’t fall on the grass – it fell on the concrete. “The horror was evident on everyone’s face as they all went, oh —-. 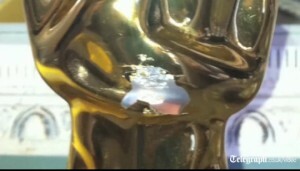 “We rushed over to look at the damage and saw a bashed head and gold plating fallen off the chest, a damaged shoulder and a dented stand. “My first thought was ‘oh —, what is that going to look like on the mantelpiece? Simon immediately phoned the Academy of Motion Picture Arts and Sciences and was advised to take the statuette to the “Oscar hospital,” located on the seventh floor of the Academy’s Beverly Hills headquarters. There, he says, the Oscar was taken by a glove-wearing woman and returned within 15 minutes, restored to it’s former grandeur. The producer now says the toddler is afraid to go near the statuette. Deux par Deux Spring/Summer 2011 ~ Western chic to take kids from school to the desert and back again! Mary Stuart Masterson Expecting Twins!